Ask any company why they chose San Diego, and chances are, they will mention these two things: the strong talent pool and the community collaboration. Whereas many innovative technology companies take care of the first item, it's places like the YMCA of San Diego County that help foster a collaborative community. By incubating strong communities, they help ensure that San Diego is a place where people - and companies - thrive. 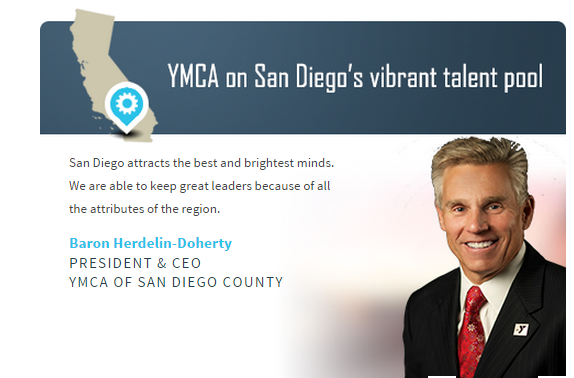 We sat down with the Y's President & CEO Baron Herdelin-Doherty to learn about how the YMCA of San Diego County - the second largest Y in the U.S. - helps support the region's dynamic economy. Our Y is driven to help families thrive as we serve more kids and families than ever before. We provide child care resources, financial assistance and active, healthy fitness programming for all ages that reflect our core values of Caring, Honesty, Respect and Responsibility. The YMCA of San Diego County is here for families at each and every stage of their journey. We focus our work in three key areas, because nurturing the potential of kids, helping people live healthier and supporting our neighbors are fundamental to strengthening communities. This year, we have secured new sites and are expanding existing sites to be able support even more families in the years to come. Since 2010, we have secured an incredible $43M in capital campaign contributions alone and we are especially thrilled to be very close to completion on the Copley-Price Family YMCA by the end of 2014. The Y is so much more than a gym. We touch the lives of nearly one out of every eight people in our community. For 132 years, we’ve been proud to help our neighbors learn, grow and thrive. What are some advantages to doing business in San Diego? The communities of San Diego County are so incredibly diverse and we are thrilled to be able to serve all. Throughout San Diego County, countless people know the YMCA. But there’s so much more to our Y than one might think. From exercise to education, from volleyball to volunteerism, from preschool to preventive health, the Y doesn’t just strengthen our bodies. It strengthens our community. We are the second largest Y in the US in part because of our location. San Diego attracts the best and brightest minds. We are able to keep great leaders because of all the attributes of the region. I immediately think of San Diego Gas & Electric (SDG&E). Not only are they committed to energy efficiency but environmental stewardship is an essential part of its culture and day-to-day business. They are vested in the quality-of-life of our region, and they give back and volunteer to improve our communities. For nearly fifteen years, San Diego Gas & Electric has been the exclusive sponsor of the YMCA’s Character Development program, a year-round focus on teaching and demonstrating the core values of Caring, Honesty, Respect and Responsibility in all Y programs. Research shows that families who spend more time together are stronger and happier. Over the next five years, the Y will focus on strengthening families in even bigger and better ways. The Y is committed to providing the memberships, programs, activities, facilities, and resources to help more families in San Diego County thrive. With 20 membership facilities, three overnight camps and multiple locations focused on childcare and youth and family services, we see opportunity to improve our services. We aim to expand to over 400,000 existing members and program participants, progressively engaging new families among the 3.2 million residents of San Diego County in youth development, healthy living, and social responsibility. By 2020, we want to have more Y family branch locations within 5 miles of every resident in the region. Additionally, we want every Sunday night to be YMCA Family Night. We will provide tools to help families track how much time they spend together and help them make plans to spend more time together. We hope you’ll engage more deeply with the Y as we officially launch our “Family Strengthening” vision in 2015.